Today marks the 70th anniversary of D-Day, a somber yet triumphant anniversary to be sure. Thousands of American troops became casualties as they stormed the beaches of Normandy in a successful effort to wrest control of Europe from Hitler and the Nazis. Thankfully, less than a year later, the war in Europe was over and democracy prevailed. However, for nearly five years prior to that moment, all Americans were caught up in World War II. Sacrifices were made not only by the men and women in uniform but by ordinary citizens back home. When confronted with stressful circumstances, many human beings rely on humor to get through. Here, then, are some of the more humorous/fun ways that Americans dealt with the war in general, the European conflict more specifically and Adolf Hitler especially. The term, “Kilroy Was Here” and the accompanying cartoon/caricature of a bald-headed man with a big nose peering over a wall or fence is well known even today. It became very popular with WWII GI’s. Research turned up no definitive explanation of Kilroy’s origin, so I’ll leave it be. 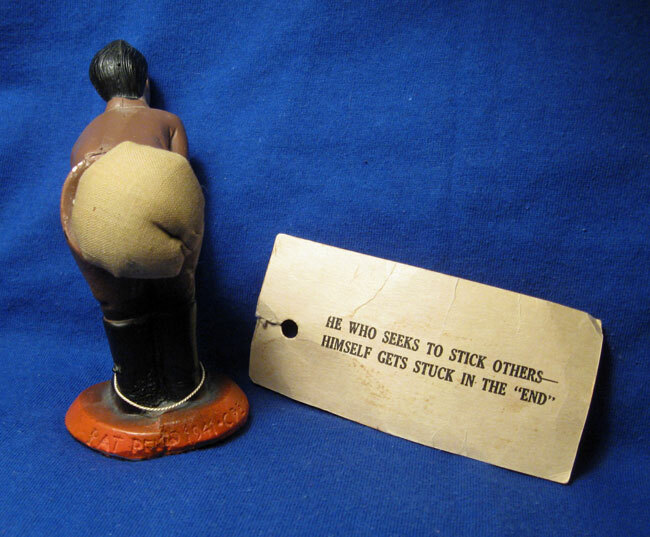 But how can anyone not like this wooden Kilroy gag on its original card? We found this in an antique shop in California two years ago. Notice that it says, “Kilroy IS Here.” That seems appropriate for the GI’s landing on the continent of Europe on June 6, 1944. Also note where the woman on the left has positioned her Kilroy. 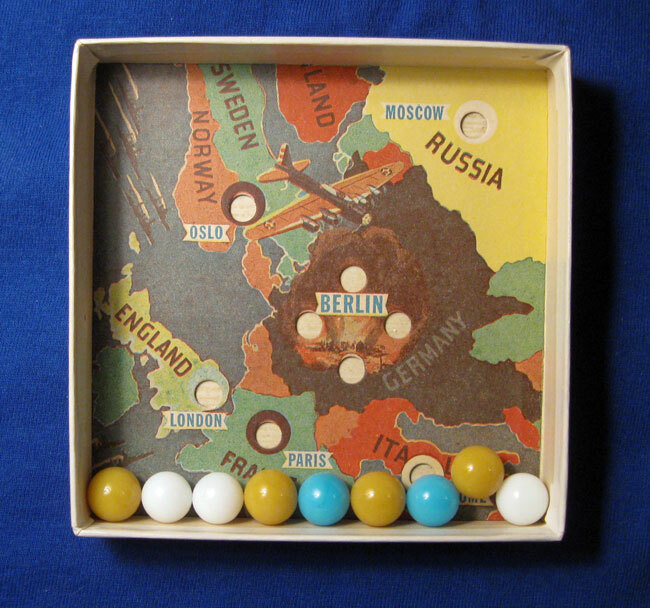 “Put the Yanks in Berlin” is a simple marble game produced by Modern Novelties of Cleveland, Ohio. 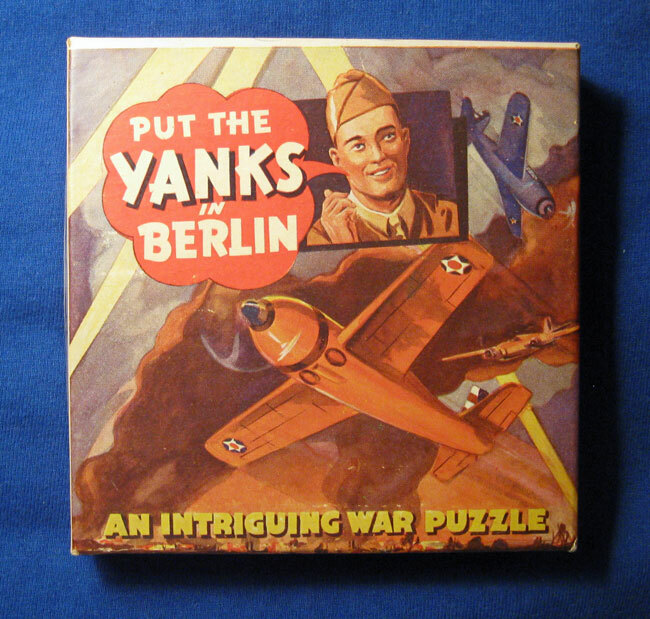 Though not dated, it is clearly from war time because the inside lid of the box mentions the strategy being pursued to defeat Hitler and the Axis in Europe. Clearly, the colorful graphics both inside and outside the box are what make this game desirable. It was easy to direct a lot of anger at Adolf Hitler, but that also led to a lot of novelty items that poked fun at him being produced. We’ve owned the “Let’s Pull Together” button for about 40 years now. 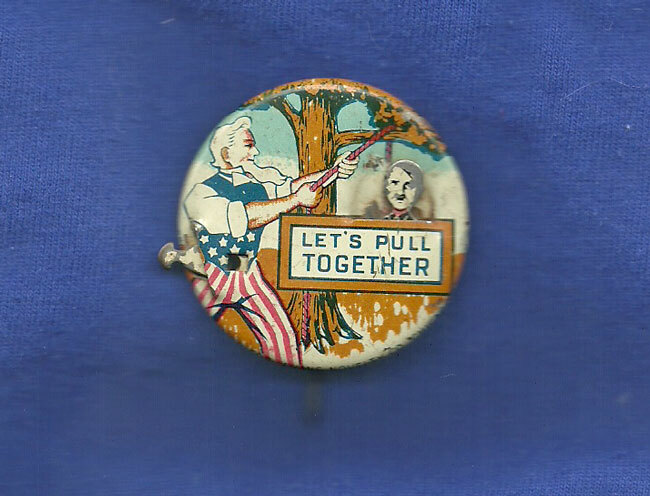 It’s a great mechanical pinback that shows Uncle Sam with his sleeves rolled up hanging Hitler from a tree. When you move the little lever on the left side of the button, Hitler goes up and down on his rope. 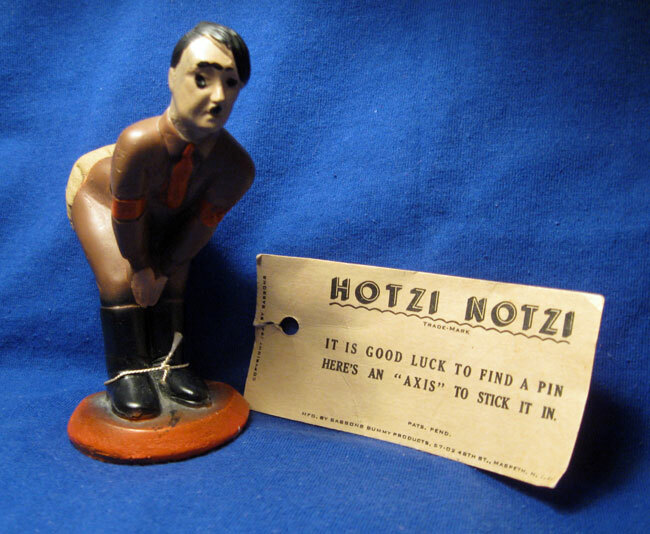 Last but not least is the “Hotzi Notzi.” This novelty pincushion shows Hitler bending over with a large padded posterior ready to take some pokes. World War II was no laughing matter, but Americans found ways to inject humor into the serious business of war, and that has made collecting WWII homefront items a lot of fun. This entry was posted in 1940's, Americana, Carol, Historical, Humor, WWII. Bookmark the permalink.